Now half way through my inaugural sabbath year I’ve gained a lot of understanding about the benefits and difficulties of an undertaking like this. As I transition from six months of not working back into my career I face a few more adjustments and learning opportunities. In some ways it will be difficult to try to continue to sabbath while also working a demanding job, but my suspicion is that will actually be easier for me than parenting full time. Without much else to share in this update I wanted to turn to a topic that usually comes up quickly when I mention I’m taking time off of work – that of money. As we’ve told family, friends and people we just met about our sabbath year situation, some outright ask ‘how can you afford to do that?’, others joke ‘wow, you must be rich’ and some have the question on the tip of their tongues but can’t quite phrase it in a way they’re comfortable uttering. No need to figure out how to ask it, I’ll just tell you. Lets talk about money. Though I’m taking six months off of work, we had budgeted for one full year. Specifically, on day one of my sabbatical, I had a savings account with enough money in it to cover one years worth of our family expenses. We had been saving that money over a period of about four to five years, earmarked for this sabbatical and separate than other savings; retirement, house down payment, kids college, etc. How did we save that much money? The math is really quite simple, you need to stretch six years of salary over the course of 7 years. 6/7 is equal to 85.7% so you need to save about 15% of they money you currently spend in order to have enough at the end of year 6 in order to afford year 7. Taxes, retirement account contributions, church tithes, etc. don’t materially affect the math. Those things all come out before you get your spending money, which is what most people are used to thinking about as their income anyhow. The spending money is the part you need to drop by 15%. How do you do that? You just lower your standard of living appropriately. Out there right now is some family near you that is living on 15% less money than you. If you do what they do, you will save enough money. Drop the number of times you eat out by 20-30% per month (groceries tend to cost about half as much, or less, than eating out) – so if you eat out 10 times, make it 7 or 8 instead. You’ll notice notice all of those are slight adjustments, none of them require you to dramatically change your life. Those small adjustments are all it takes. But, if you don’t want to adjust everything by 15%, you can chose to save more than 15% on some category in order to not have to cut back other categories as much. You can make large wholesale changes that have a larger impact. During our saving period, my wife and I lived in a studio apartment as our family grew to include two kids. We saved roughly 50% per month on rent, our largest expense. Because of the size of that change, we were able to catch up with the fact that we didn’t actually have six years to save. Was it hard work? Yes. Was it worth it to be able to take a year off of work? I continue to think so. This is the best savings advice I’ve ever gotten and I pass it on often. The easiest way to save money is to never have to cut back your lifestyle in order to save it. The easiest way to do that is to earn more income but never change your spending. That way you don’t mentally feel like you’re moving backwards, you just feel like you’re staying in the same place but all of a sudden you have saved a lot. If you can’t yet bring yourself spend none of your raise, at least don’t spend all of it. Save 10%, 20% or 50% of it by only adding the other part of it to your budget (or by stashing it away via auto-transfers so you never see it). That way you’re getting some bump in lifestyle but also reaching your savings goals. This is particularly effective during the early parts of your career when your salary growth is the most rapid due to you going from having no experience to some. 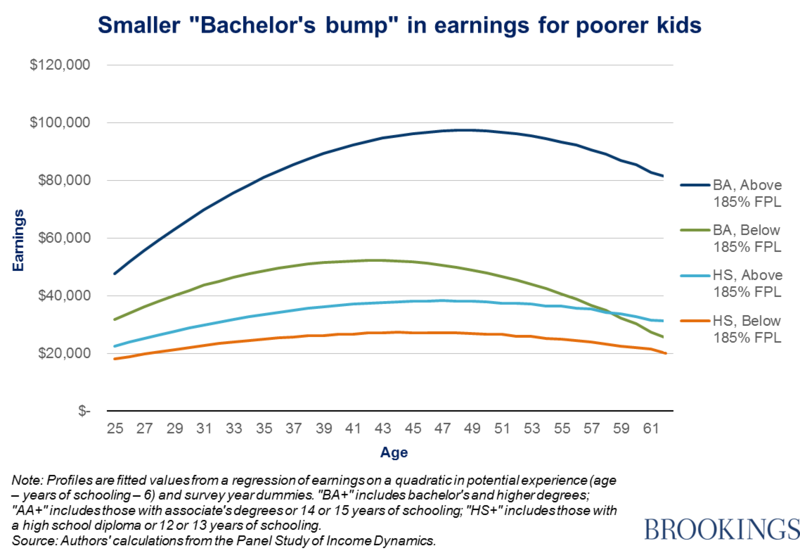 For most people, of various salary and education levels, their salary will double from when they start working to their peak some ~20 years later. For the purposes of saving 15% you would actually want your salary to be 30% higher by the end of 5 years. That is because the years would average out – the first year with 0% growth averages with a middle year of 15% and the final year at 30% – that equals 15% total, which is your goal. Using the chart above, you can see that 30% growth over 5 years is reasonable for the early years of various income levels. In our case, this was in large part how we were able to do it. We just kept trying to spend the same amount. During the first year I lived in an apartment I could afford and with each year that passed we stayed in the same place, even as my salary grew. We could have afforded to move into a bigger place, and a lot of people asked us why we didn’t. We knew what we were saving for. Affording a year off doesn’t require you to be rich. A person making $10 Million per year needs to save the same percent as someone making $6/hour – 15%. I agree that it is in some ways easier to save money if you are earning a higher income – but there are plenty of people out there earnings stupid amounts of money and still saving none of it because they are anchoring their standard of living to those around them that also earn high incomes. Think about it, a person making $5 Million a year probably has co-workers making the same amount and a boss that makes even more. Where do you think they go out to for lunch? What do you think they talk about? The same topics as everyone else – what they’re doing on the weekend, what cars they just got, what new gadget they hope to get for their birthday, where they want to vacation next year. The stuff those $5 million earners talk about is just really expensive stuff. If our example person lets themselves anchor their standard of living to those peers, they’ll end up saving 0%. 78% of NFL players are bankrupt 2 years after they retire, despite the minimum NFL salary being $500k. Why? When the guy in the locker next to you makes $10-20 million per year, and you hang out together. So how do you prevent this? Anchor yourself to a lower standard of living. The easiest way to do that is to spend time around more people that earn less money than you. That will help you see what spending 15% less looks like and make it seem normal. There are some quick ways to do this. For work friends, hang out with people that are either younger than you or from a department/team that pays less. For outside-of-work friends, find people that work in different industries or roles. I have a few friends that work for churches or non-profits. Those roles are well known for not being high paying jobs. As we hang out I’m conscious of letting their standards of living and expectations of life help me define what is normal rather than letting some of my work friends who earn the same or higher incomes than me do so. As 2017 closed I look a look at my budget and realized we had actually only spent 67% of our planned spend. We had saved 100% of a normal year’s spending money but realized that sabbath year’s spending money was actually less. Part of this is because a large number of your expenses are caused by work or by your lack of having free-time due to working. For example, once I wasn’t working, my commuting expense dropped to near-zero. The amount we spent on babysitters also dropped because we had a lot more free time. Your lunch expenses might drop as well if you’re able to eat at home instead of going out to lunch. We also saved money on things we used to justify because we were so busy, like ordering in dinner when we had no time to cook or paying for 1-day shipping because I didn’t have time to go to the store to grab something I needed for tomorrow. Not being tied to work also meant we didn’t have to live in the same place. I happened to work in a very expensive place to live and so being close to work was expensive. Once I stopped having to work, living close to work didn’t matter anymore and so we could live someplace less expensive. A lot of the money we saved is because in our case we ended our lease, put our things in storage and moved to a less expensive town. We actually lived with family in an in-law apartment, but even if you don’t have family that can generously host you like that, you could move to a less expensive town, or part of town, for a bit. There are also some tax savings you get by taking a year off. Because I split my sabbath over two calendar years, I would be earning 1/2 of my normal salary each of those two years. The way the U.S. tax system works you tend to pay a larger percentage in taxes as you earn a higher income. So by earning only 1/2 a salary over two separate years, I actually got taxed at a lower percentage on each of those years and thus got to keep more of my salary than I normally do. Be careful here though, some taxes actually work the opposite way. Social security tax for example caps at $118,500 currently. That means you stop paying that 6.6% after that amount. So if your salary was above that, and you cut it in half, you lose what is essentially tax-reduced earnings on anything you would have otherwise earned. I ran into a similar issue with itemizing deductions. For me, the tax pros outweighed the tax cons. One thing to think about is how quickly you will be able to return to work and if taking the time off will have an impact on your future earnings? The easiest way to return to work quickly is to be on a company sponsored sabbatical. The second easiest way is to have offers from other companies before you go on your sabbath. The hard path is having to start interviewing during the year, it could take 3-6 months depending on how in demand your skillset is. In our case I was on a company sponsored sabbatical and so returning would be fairly easy. Thinking about how taking time off will impact your earnings, there are a few scenarios. In some fields, time away might mean you are rusty and so perhaps your return salary will be a bit lower. Even if you are able to return to the same exact salary, you will have one year less experience than you would otherwise have and so you will be giving up a year of growing in your productivity and any raises you would have gotten during that time. On the flip side, if during the sabbath year you are able to rest, refocus and invest in yourself, that will likely produce much higher returns. An energized employee with a redoubled focus will likely do much better to exceed expectations and earn future raises. Taking a sabbath year isn’t something for the rich only. Anyone that plans ahead and puts in the hard work of scaling back spending can do it. The math works out to 15% but due to some of the extra savings during the year I think you could actually get away with a number closer to 10%. So how much are you willing to sacrifice in order to not have to work for a year? Are you willing to pretend like your salary is 10% lower? If so, you can make it happen.